When the Wizards took their mission they roamed Middle-earth, but Radagast was never much of a traveller. There is not much to be told about his early journeys, but by the late Third Age he eventually settled down and dwelt, for a time at least, at Rhosgobel somewhere between the Carrock and the Old Forest Road. Situated on the western borders of Mirkwood, it can be assumed that the Wizard held watch against the Shadow of Dol Guldur that slowly engulfed the forest. It is likely that he became acquainted with the inhabitants of that region. Close to animals and birds, he was friends with the great eagles. Although the neighboring Beorn was unsociable, he used to see him from time to time, and he considered Radagast 'not bad' for a Wizard. As one of the Maiar of Yavanna, Radagast had a great interest in the kelvar and olvar of Middle-earth and was a friend to beasts and birds. Gandalf, however, held greater respect from, and knowledge about, birds than Radagast. 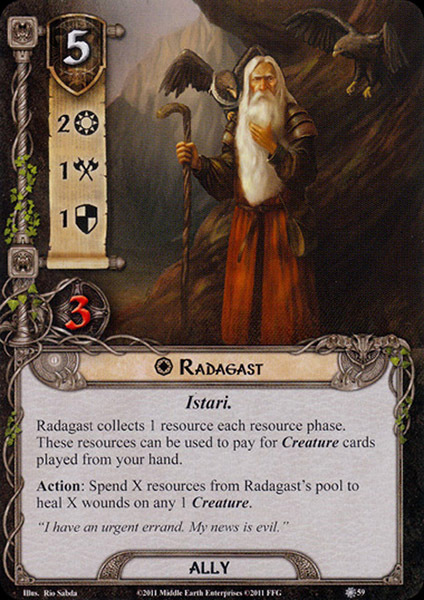 Radagast displayed some qualities of innocence and naivety, making him an ideal accomplice of Saruman's plans, seen in providing his services to help the White examine the Gladden Fields. Saruman in turn considered him Simple(minded) and a Fool. In a manuscript written by Tolkien in 1954, the name Radagast is said to mean 'tender of beasts' in Adûnaic, the language of the Númenóreans. However, in a later note Tolkien said that the name is in the language of the Men of the Vales of Anduin, and that its meaning is not interpretable. The similarity to Old English rudugást meaning 'red-brown spirit' has also been noted by fans. The name Aiwendil (pron. [aɪˈwendil]) is Quenya for 'lover of birds'. It is obviously derived from aiwe ('(small) bird') and ndil ('devoted to'). 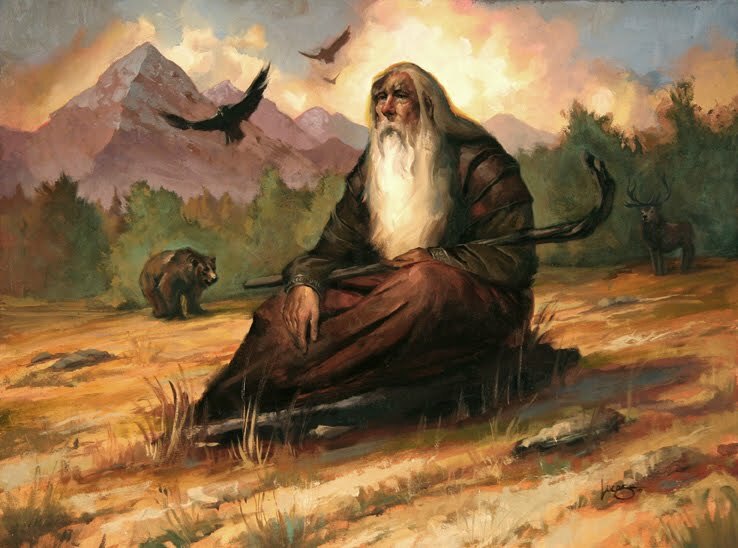 Tolkien initially called him 'Radagast the Grey', but in pencil he changed this to 'Brown' and subsequently Saruman refers to him as 'Radagast the Brown'.